It is advisable to use permeable, traditional plasters with earthen building. A good example is comparing Adobe and cement. Adobe is a softer material than cement and both expand and contract at different rates. Using a cement plaster over adobe can lead to irreversible damages. Moisture retention becomes as issue as well. 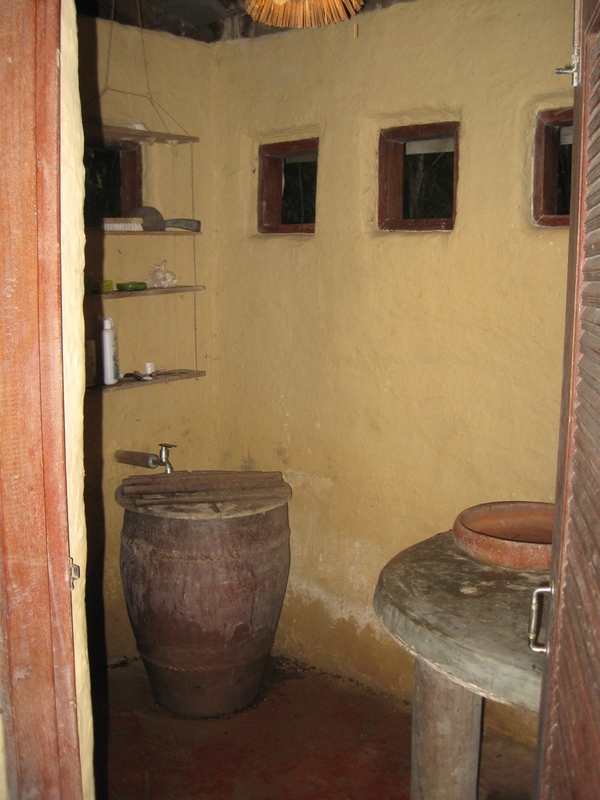 Earthen buildings have a breathable and permeable plaster such as mud plasters or lime. These allow the building to absorb moisture and also release it. When cement is used on an earthen structure, problems may start to appear especially with moisture content. I noticed a possible example of this while living at AsaLanta. The first house that was constructed has a concrete perimeter base around the exterior, which was added after construction. On the interior of the bathroom, the wall with the concrete exterior is started to erode. From the outside water can soak into the wall behind the concrete and can not be released and dry out. From the inside moisture builds up from the use of the shower. On the interior wall opposite the eroding wall, no damage is happening. It seems that the concrete is preventing the constant cycle of wet and dry. Another good example, is the adhering of the cement to the adobe. Cement does not want to stick to adobe, does not want to stick naturally. Wire has been used in the past to help the concrete stick better. You can see here there is now a gap between the two materials. Cement is a big contributor to greenhouse gas emissions through its embodied energy and transportation. Try to limit the use of concrete. Asalanta is on an island in southern Thailand with an intense rainy season and vicious termites. Concrete foundations are used for their earthen buildings.